Bucyrus Community Hospital, Inc. & Affiliate, Debtors-in-Possession, (“Bucyrus”) is a 25-bed Critical Access Hospital providing inpatient, outpatient, and emergency care services. MelCap Partners acted as the exclusive investment-banker and financial advisor to the Debtors through a plan of reorganization under §363 of the Chapter 11 Bankruptcy Code. 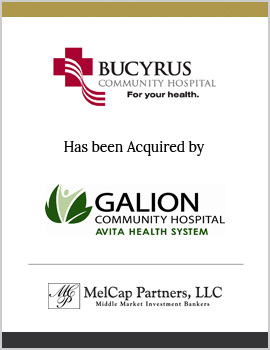 Bucyrus Community Hospital was sold to Galion Community Hospital, Avita Health System, an Ohio non-profit organization.